Canon has announced two new photo printers. The first one is called Canon SELPHY CP790 (you can read about the other, Canon SELPHY CP780, here) and looks pretty cool. The photo printer can print postcard sized images in 47 seconds. The software that comes with the Canon SELPHY CP790 can be used with both Windows and Mac computers. Amstelveen, The Netherlands, 10 June 2009. : Canon is putting the fun into photo printing with the introduction of the SELPHY CP790 – a smart, compact photo printer that makes it easier than ever to produce lab-quality prints. The SELPHY CP790 is smartly designed for maximum ease-of-use and convenience. A large 3.0” LCD display and Canon’s Easy-Scroll Wheel makes it simple, quick and easy to set-up, navigate and enjoy. The SELPHY CP790 incorporates a range of fun templates and layouts so users of all ages can customise their images creatively, whilst Automatic Image Correction features ensure that stunning lab-quality images are effortlessly produced. With an integrated carrying handle, storage basket and optional battery pack, the SELPHY CP790 also enables users to print wherever they are – no PC required. The SELPHY CP790 comes with everything needed to produce lab-quality photos simply and quickly. The angled 3.0” LCD display and Easy Scroll Wheel make it simple to operate. A built-in PictBridge port and memory card slots make it easy to print directly from a wide range of digital cameras and memory cards – so there’s no need to connect the SELPHY CP790 to a computer. Users can even produce prints directly from their mobile phones via Infra-red or an optional Bluetooth adapter. The SELPHY CP790 is fast, flexible and fun, producing lab quality postcard sized prints in as little as 47 seconds, while a range of optional paper cassettes enable everyone to produce L, Wide, Credit Card Size and Mini Size stickers as well. The SELPHY CP790 uses a dye-sublimation printing process to produce smooth, lab-quality photo prints; with a special coating also ensures they’re protected from spills, splashes and smudges. With lasting quality – each print should last for up to 100 years when stored in an album –the SELPHY CP790 is a great way to preserve precious family memories. The SELPHY CP790 also includes a range of Automatic Image Correction functions, such as Red-Eye Correction, Skin Tone optimisation and Noise Reduction that automatically enhances the quality of the photos. The My Colors option also enables users to quickly add special effects such as Sepia, Vivid, Positive Film and Black & White to their prints. 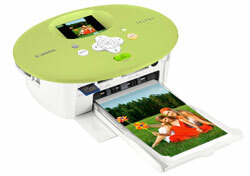 Families can personalise their photos using a range of creative functions that are built into the SELPHY CP790. Photo Diary enables users to insert their photos into a range of six different diary layouts, with dedicated areas for text, a choice of six background colours and 17 different fun stamps. Images placed in Photo Diary layouts can be trimmed, cropped and enhanced, while the image shooting date can be taken from an image and placed in the layout. The SELPHY Photo Print software bundle for Mac and PC has been smartly designed to assist users through the printing process on screen and via voice guidance instructions. Stylish and compact, simple and smart, the SELPHY CP790 makes it easy for anyone to produce lab-quality photos whatever their level of expertise. With its range of creative functions and convenient features, it is also ideal for families who want to enjoy creating together, whilst sharing precious memories. Purchasers are also eligible for membership of CANON iMAGE GATEWAY, an exclusive online storage and sharing site with 100MB of online ‘personal gallery’ space.